My Home Inspector Blog: Mountain-Biking Home Inspector in Poway Tackles Iron Mtn. This day, before leaving the office for my home inspection, I loaded my 27-speed GT mountain bike on the back of my vehicle and packed my riding gear. I was finished with my day's work by 3:00 pm, so I traveled east on Poway Rd. towards Iron Mtn. The trail head for Iron Mtn. is at the junction of Route 67 and Poway Rd. There is ample parking available (although the lot is very dusty) and public restrooms are available. The peak of Iron Mtn. is 3500 feet in elevation, and this particular trail to the peak is three miles long. The first quarter mile or so was easy-going through a lush, green mountain meadow. Farther on, the trail began to meander through sage brush as it slowly gained elevation. After crossing several small, bubbling streams, I began to quickly gain altitude. About three-quarters of the way up the mountain, I arrived at the Ramona overlook to the northeast. Even at this elevation, the view of the eastern valley began to open up. From this point on, the trail became steeper and steeper. There were also frequent switch-backs and large rocks to traverse. I believe even the best of mountain-bikers would have a tough time riding all the way to the peak. At this point of the ascent, it seemed I was carrying my bike more than riding it (Thank God for a lightweight bike! ), but finally I made it to the peak. At the top my jaw dropped. There is a stunning 360-degree view- well worth the climb! Looking to the west over Poway, the sun was beginning to set over the ocean. A vista like this really puts you in awe of God's beautiful creation! After spending several inspiring minutes at the top, it was time to begin my descent. I will have to say, I enjoyed the ride down much more than the one on the way up! In a short amount of time, I was back down in the parking lot, looking up at Iron Mtn. and reflecting on the exhilarating ride I had just completed. All that fresh air, and exercise to boot! Steve Stenros is a CREIA inspector holding the MCI (Master CREIA Inspector) designation. When you need the services of a professional home inspector in Poway or any other part of San Diego county, First Choice Inspections is available for all your home inspection needs. Steve can be reached for appointments at 888-335-3040. What a beautiful area and great place to bike! LOL when I first caught sight of this blog entry, I wondered how you took your ladder to home inspections. Lots of good local information in this article. Looks like a fun challenge on a bike! Very awesome views and what a great way to enjoy them on a bike. Thanks for sharing the photo's. Diana: It's especially beautiful this time of year when everything is green! LOL Wanda: There is actually a home inspector near me who mounts his collapsible ladder on the back of his motorcycle! It seems to work well for him. Pat: The views from the peak are stupendous!! Glad you enjoyed the video. 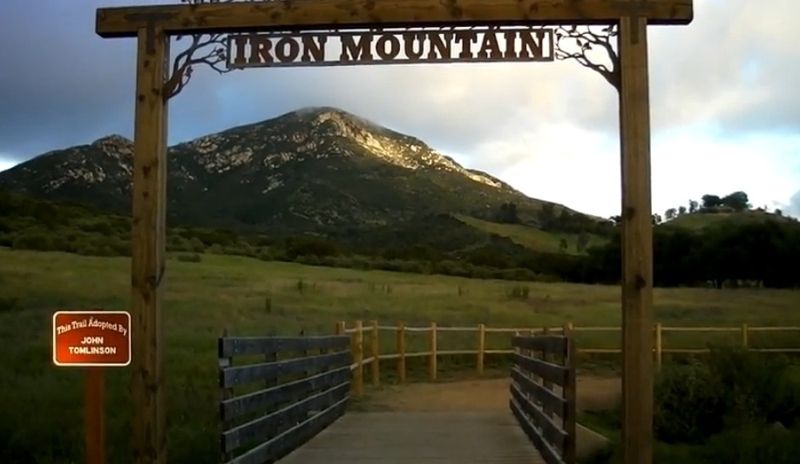 Steve - The last time I hiked Iron Mountain, we saw two rattlesnakes on the trail. Wow! Great photo, Steve. I out-ran them with my bike! Thanks, Barbara. I had a blast!